of blond and discolored wires. Oils of Grapes and Passion Fruit. From 25 to 40 applications. Promotes hygiene, moisturizing and tinting. Formulated with creatine, d’pantenol and anageline, active nourishing the hair bulb, stimulating the growth of stronger strands from the root. With high power of tinting, it equalizes the warm tones, promoting a cold nuance to the hair. Made with amino acids and last generation moisturizing active ingredients. Restores damaged wires. Finisher without rinsing, elaborated with bioflavonoids and cupuaçu. It has protective thermo action and atioxidant. Provides protection, softness and intense luster to the wires. It can be used to finish any type of procedure or as a pre-brush. Wash your hair with the violet shampoo, massaging well. Rinse and repeat the operation, allowing the foam to act for 3 minutes. 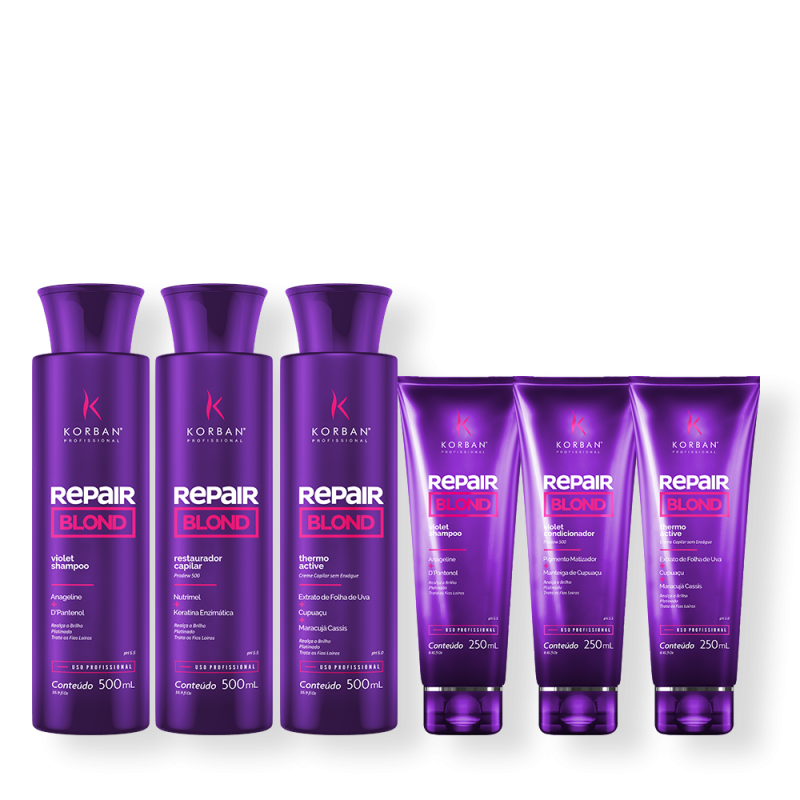 With damp hair, apply the violet restorer, spread well, massage and let it act until the desired tone is obtained, on average the action time varies from 5 to 15 minutes. Then rinse thoroughly. Remove excess water with a towel, stacking a small amount of active thermo in the wires and comb. Then finish with wishing.